Employers should consider the fact that people in general are becoming more socially active and one way or another, their activism is likely to bleed into their workplace. But as importantly, heightened social awareness is now leading workers to want more from their companies. A report from Globoforce’s WorkHuman Analytics & Research Institute found that increasing social activism and hot-button trends has employees reconsidering how they think and feel about their employers. The study, Social Impact in the Human Workplace, looks at how movements such as #MeToo and #TimesUp, along with record low unemployment, are causing a power shift in the workplace. Among other things, the survey found that employees are paying special attention to pay equity. Not surprisingly, men are more likely to believe they are paid fairly (70 percent), compared to women (61percent). Meanwhile, more women than men reported not receiving any monetary bonuses. Pay aside, employees want companies to do more to align their management style with how work actually gets done today. That means creating workplaces where workers believe they’re fairly compensated, feel safe, are heard, have strong connections with both their managers and co-workers and feel recognized. “This year’s employee survey tells the story of a workforce ready to make an impact – but unwilling to stick around if inequity and bureaucratic processes get in the way,” said Derek Irvine, Globoforce senior vice president of client strategy and consulting. The report says employees expect more from their employers, largely because they’re developing a distrust in positional authority (Unfortunately, the report hints they’re being egged on by “the media today, and the latest targets are the C-suite and Human Resources.”). Employees increasingly want their voices to be heard, to be recognized for their accomplishments and to have transparency in the way they are rewarded and evaluated. 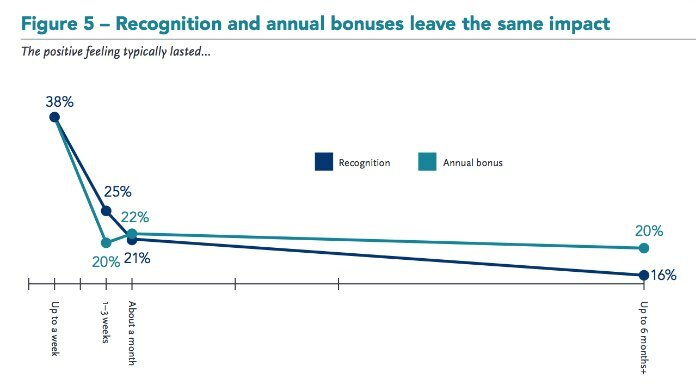 Among the report’s more interesting findings is that an employees’ positive reaction to recognition lasts for about as long as it does for traditional bonuses, at least in the short term. For both recognition and annual bonuses, the survey found, 38 percent of respondents said their positive feeling lasted about a week. The numbers shift over the longer term, however, with 20 percent of those receiving an annual bonus still feeling the love after six months, compared to 16 percent of those who’d received some other form of recognition. Globoforce suggests that redistributing the budget for annual lump-sum bonuses may result in a greater impact since recognition of a worker’s contributions could be spread across the year. “For example,” the report said, “instead of receiving a one-time annual bonus of $5,000, an employee would receive 50 recognition awards at the time of achievement, each in $50 increments.” That sounds good in theory, but we think employers should undertake some careful research about their workforce’s opinion on the matter before making such a move. Most employees haven’t been recognized recently: Only 16 percent of workers have been recognized in the last month, and 70 percent of companies have no formal recognition program. Yet recognition has an impact, with 73 percent of workers saying recognition by executives is a positive experience and 88 percent saying the same when the recognition comes from co-workers at all levels across the company. Workers want more frequent check-ins with their managers. More than a third—35 percent—of employees check in with their managers weekly, but a notable number of companies continue to stick with traditional annual reviews. Traditional compensation can present pay-equity risks. More women than men reported not receiving any bonus. In the U.S., nearly twice as many men received a bonus greater than $5,000. Psychological safety varies greatly by gender and position.While 82 percent have a sense of belonging in the workplace, when asked if they feel safe enough to offer a dissenting or unpopular opinion, on 65 percent agreed. Sixty percent of women feel safe speaking up, compared to 70 percent of men. Among other things, Globoforce provides a social recognition platform and “works to foster human connections” in the workplace. Draw your own conclusions about their bias.